Marchie Murdock, 2013 Alumnus, runs out of the tunnel before a game. He is now a free agent in the NFL. 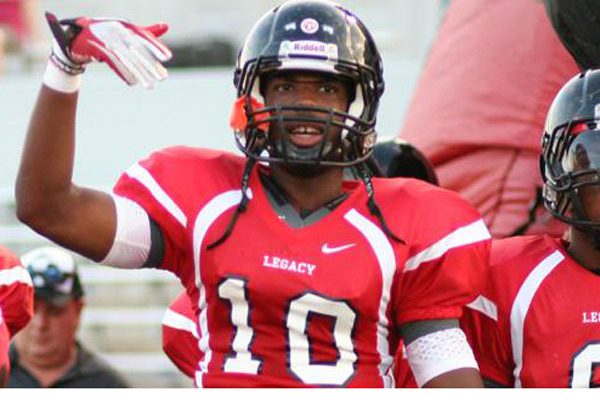 During his career at Legacy, Murdock had 82 catches for 1,235 yards and 18 touchdowns. He received offers from Illinois, Colorado State, the Navy and San Diego State. But after graduation in 2013, Murdock went to Illinois University on a full athletic scholarship and spent two years there. He grew tired of the coaches and the program at Illinois and decided to transfer to Iowa State University. In 2017, Murdock put up good numbers and built up a case for a career in the NFL. Although Marchie did not get drafted, he was signed as a rookie free agent with the Dallas Cowboys. He played well through the first several pre-season games, but suffered an ankle injury that resulted in him getting released from the team. Now, Murdock appreciates the opportunity of being exposed to the pro-life. 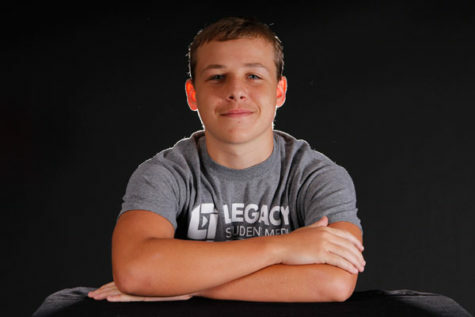 While at Legacy, Odhiambo bloomed a little later than expected. He did not play football until his junior year. After putting up a solid senior season, he received an offer to play football on the collegiate level from Boise State University. So in 2013, Odhiambo took his talents to Boise. His freshman and sophomore years he played in a few games and even started several. During Odhiambo’s junior year, he earned a spot on the All-Mountain West Second Team. And as a senior, Odhiambo managed to make the 2015 All-Mountain West First Team and caught the eyes a few NFL scouts. In the third round of the 2016 NFL draft, Odhiambo was selected 97th overall by the Seattle Seahawks and played there ever since. He started a handful of games in 2017, but on September 8, 2018, he was waived from the team and released to make cap room for his ‘replacement’. Josh Doctson hauled in 53 catches for 778 yards and five touchdowns throughout his senior season at Legacy in 2010. Doctson left Legacy on a full ride to play ball at the University of Wyoming. Despite committing to the school, he left after his first year and transferred to Texas Christian University. And while at TCU, Doctson put on a show and finished his junior and senior year with over 1,000 receiving yards each. In the first round of the 2016 NFL draft, the Washington Redskins selected him in the first round as the 22nd overall pick. Since then, Doctson has been playing on and, dealing with injuries, but while he’s on the field, he’s shown promise. Doctson stands out as one of the Redskins top receivers, if not the top receiver on the team. Tevin Mitchel had 75 tackles, was voted Second Team All-State, and came out of high school as No. 24 of the top recruits in Texas. Tevin continued his football career at the University of Arkansas in 2010. After his four years at Arkansas, Mitchel finished with 157 total tackles, four Interceptions and 18 pass break-ups. He was drafted in the sixth round of the 2015 NFL Draft; unfortunately, he suffered an injury during his rookie camp. Mitchel tore the labrum in his right shoulder that resulted in the team waving him and him getting picked up by the Indianapolis Colts. There, Tevin spent two seasons with the team before getting cut his third year during the pre-season. Now, Mitchel resides with the Oakland Raiders who signed him at the end of last season. WWE enthusiast. I love to play football and want to take my talents to the University of Oklahoma. I love me some Jesus. Never mind a good time.